Heat gas or charcoal grill to medium-high heat and gather the rest of your ingredients. Toss frozen French fries with 1 tablespoon melted butter. 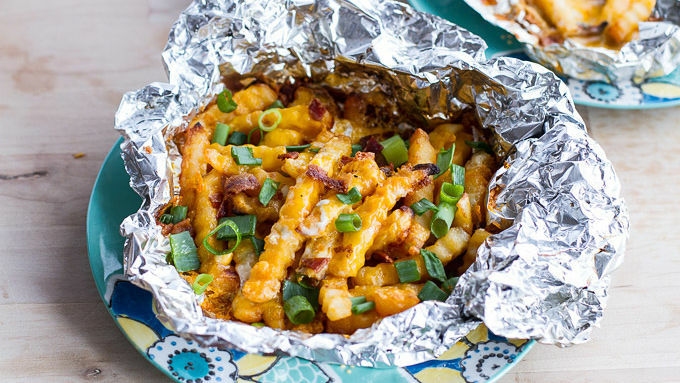 Place 1/4 of the fries in a single layer in the center of the first piece of foil. 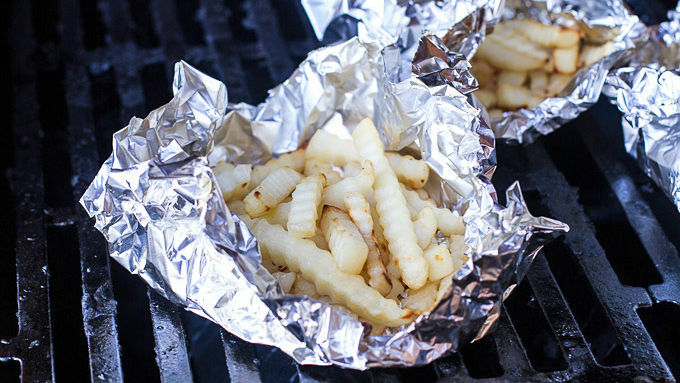 Loosely fold foil around edges, leaving a large hole at the top to allow steam to escape; repeat with remaining fries and foil. 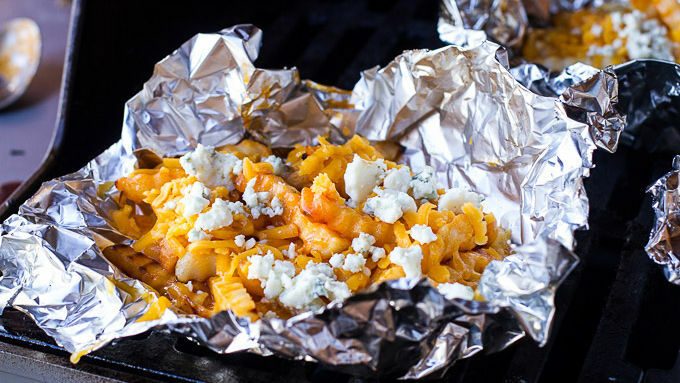 Place foil packets on preheated grill. Cover grill; cook 20 to 30 minutes, stirring once, until fries are crispy and baked through. Meanwhile, mix together the buffalo sauce with the remaining 2 tablespoons butter. Carefully open the foil packets and drizzle each packet with as much of the sauce as desired. Toss fries to coat evenly. 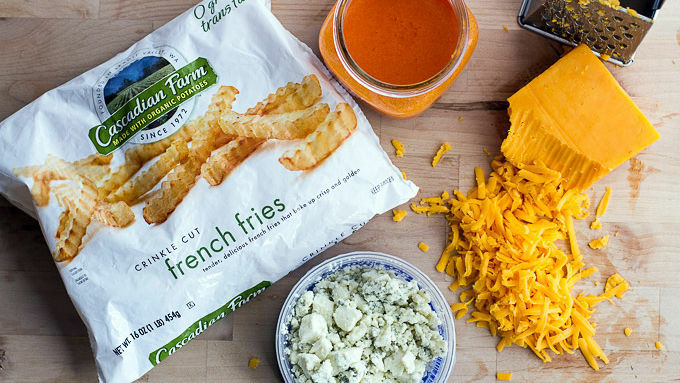 Sprinkle each packet with cheddar cheese and blue cheese, dividing the cheeses evenly among the packets. Cover the grill and cook another 2-3 minutes or until the cheese is melted. Remove from the grill and top with sliced green onions and bacon. Garnish with cilantro and serve immediately. If you don’t have a grill, use the same method in the oven. Just preheat the oven to 450ºF. You can add 1 cup cooked, shredded chicken, if desired. Add to packets with the cheeses and cook until heated. These cheesy grilled fries are so easy to make outside. Give 'em a try! Regular fries or cheese fries? Hmm, that is a tough one. Yeah right! 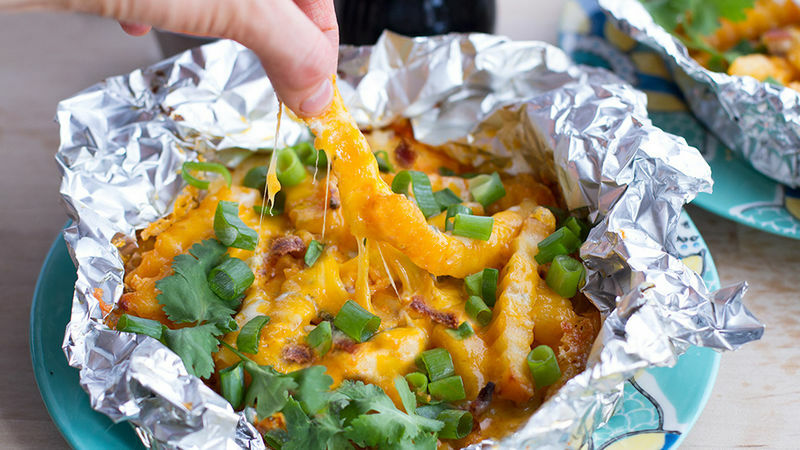 Cheese fries all the way. Honestly, cheesy fries are the way to go, especially when they're covered in buffalo sauce and topped with bacon bits. I mean come on, that is just too good! So it's kind of obvious that I adore these fries. My family is huge on anything covered in buffalo sauce and, yes, we also love fries and cheese. Are you with us? Since it's crazy hot outside and nobody wants to turn on the oven, we're grilling these up in cute little individual foil packets. It’s actually really fun and easy to do. Plus, the individual packets are perfect for entertaining! If you don’t have a grill, use the same method in the oven. Just preheat the oven to 450ºF. You can add 1 cup cooked, shredded chicken, if desired. Add to packets with the cheeses and cook until heated. Dig in!